Smoothie recipes are easier and quick to be performed and these are packed with a number of refreshing fruits and monounsaturated fatty acids and are vital to decrease belly fat and those deposited at other parts of the body. Smoothie recipes are not just meant for slimming, but are creamy, tasty, filling and are perfect for lunch, breakfast and snack. The reason why smoothies are perfect for weight loss is that, the user is able to extend their control over the ingredients. They are relatively prepared to carry low-calorie and are laden with essential ingredients capable of keeping the person full all day long. Liquid base: Include double toned milk that has less fat content but is rich in calcium and vitamin D. this helps the body to break down its fat, but nondairy products such as almond, soy is fine as well. Proteins: Including lean proteins in smoothie helps the user attain lean muscle mass and they also help to burn calories all day. Best sources are silken tofu, non-fat yogurt and protein powders. Healthy fats: These are to be included in the smoothie to offer energy, these indeed gets the recipe more appetizing and satisfying. They also help the body absorb more vitamins. Best sources of these healthy fats are avocado, nuts and seeds. High fiber carbohydrates: Any fruit would offer this, be it blueberries, raspberries or strawberry. They offer fiber and good quantity of sugar, for veggies cucumber and spinach are best alternatives. Ingredients to Avoid while preparing smoothies: As there are a number of supplements and foods to be included in smoothie to get the intended flavor with fewer calories, there are some pitfalls as well. Though smoothies are healthy options to reduce weight, there are essentially some ingredients to be avoided to use smoothies as perfect weight loss tools. The first important thing to avoid is sugar, even if they are healthy and sourced from honey or fruits; it should be kept in control. Avoid canned vegetables and fruits: Canned foods are often stored with preservatives and sweeteners that could enhance the calorie levels. It is always better to use fresh products and if not available, frozen food is next alternatives. Canned fruits also lack nutritional value. Dairy products: Though dairy products such as ice-cream, milk and yogurt are common ingredient in any smoothie, they are abundant in calories. Avoid dairy products in smoothie recipe completely; else use products that are high in proteins but low in sugars. 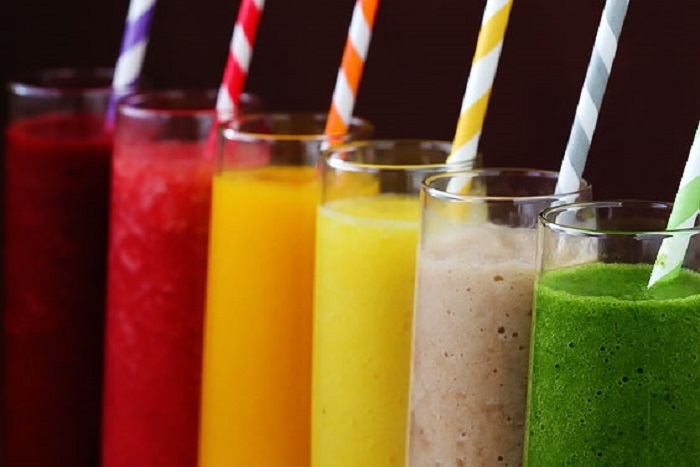 Juices: Avoid using fruit juices in smoothie recipe as these are usually high in sugars and low in nutritional value. Many of them have artificial sweeteners with no fiber content. Avoid using protein powders: Many think that protein powders are best sources to get protein in the diet, but natural sources of protein are always best when it comes to weight loss. Though these protein powders are good for adding weight, for weight loss program it is good to stick on to healthy proteins such as seeds, gelatin, nuts and yogurt.